Between trail runs, huckleberry picking, dinner parties, work, and other stuff, we managed to carve out a little weekend for a backpack out of Crested Butte. It had been on the calendar for a couple of months when last week we got wind of an advertising stunt by a “beer” (I use the term loosely) company to be held in the town of Crested Butte for the very same weekend. I emailed Jeremy and asked if he still wanted to go. He replied that no one attending that event was going to be anywhere near the backcountry. So true. So thankfully true. We had not hiked out of Schofield Park before, but were familiar with it as a potential emergency “exit” from a previous backpack we did in 2005. Back then we began the Four Pass Loop out of Aspen. It is likely one of the most popular backpacks in the state of Colorado. 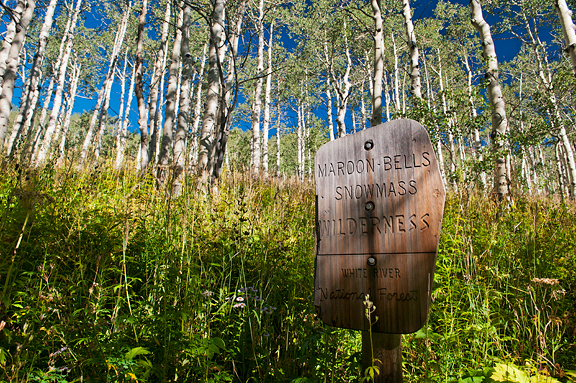 The route crosses four 12,000+ foot passes in roughly 24-26 miles (depending on where you start and end) and loops around the iconic Maroon Bells through some of the most stunning high country you could imagine. 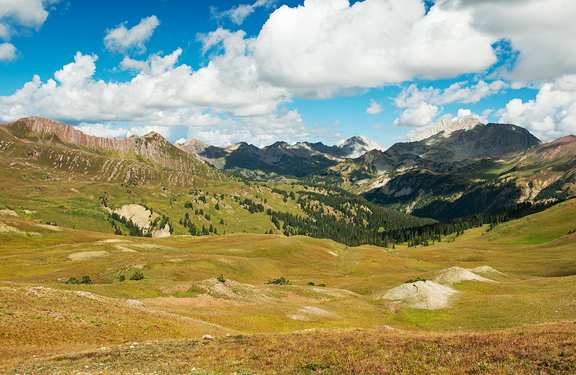 From the Crested Butte side, you can access the loop from Schofield Park. Jeremy and I hiked a few miles of new (to us) trail before linking up with the Four Pass Loop and heading up to Frigid Air Pass. As we rounded a boulder and gained a small bench in the terrain, a little tarn next to a trail junction sign was immediately familiar. I blinked back tears. The last time we were here, Kaweah was with us on her very first backpack. I took a photo of her resting at the base of the sign. The significance was that she was actually resting. She never stopped charging ahead until we set up camp for the day. Then she would curl up, fall asleep, and snore loud enough to scare away the bears. 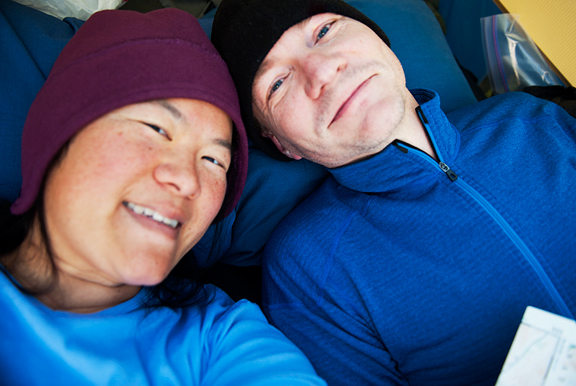 It’s been over two years since our last backpacking trip as Kaweah’s care demanded more attention and time. 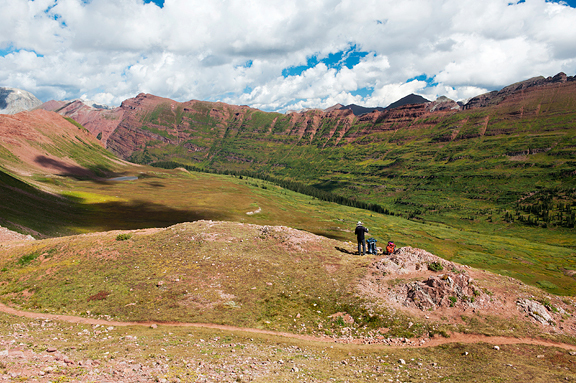 Our preference is to backpack before or after the crowds of summer. The backcountry becomes that much more enjoyable when we have it to ourselves. 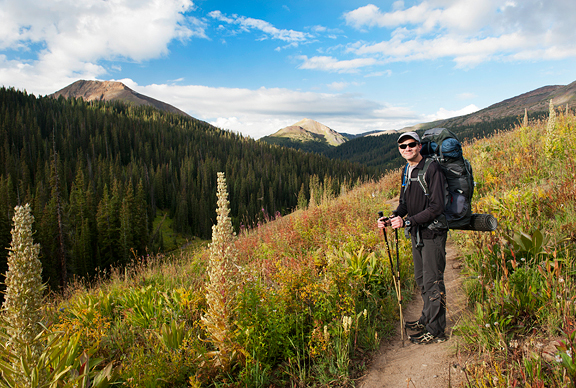 Backpacking is one logical extension of hiking. Trail running is another extension of hiking, but in a different direction. 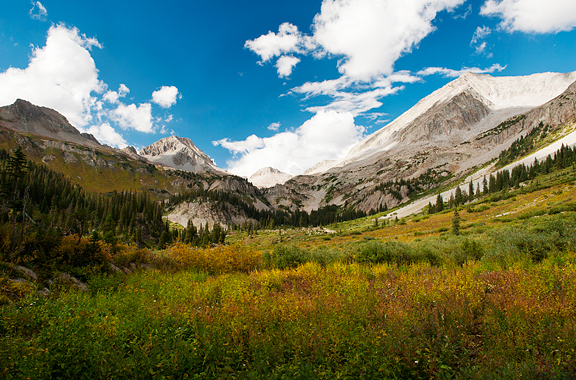 Still, all three share the same goal for me – to travel the high country. I feel better when I spend time hiking or running through mountain forests up above treeline and into the alpine meadows. It makes me stronger, clarifies my thoughts, brings me tremendous joy. On the trail, we plucked juicy red raspberries, one enormous sun-warmed wild strawberry (enormous for a wild strawberry, but smaller than a dime), plump twisted stalk berries, and several huckleberries to nosh as we hiked toward our destination at the lake. Once in camp, I was more than happy to get off my feet and fall asleep to a rising moon and the sound of small animals scampering around our tent. 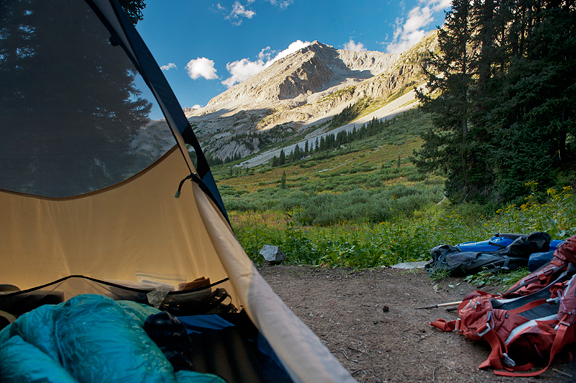 I used to stay awake all night in my early days of backpacking, listening for bears, deer, elk, porcupine, mice, anything that would come poking (and nibbling) around camp. Maybe it’s the impenetrable bear canister or the long miles of the day caught up to my body or getting older, but sleep comes easier. Maybe I’m just happier. 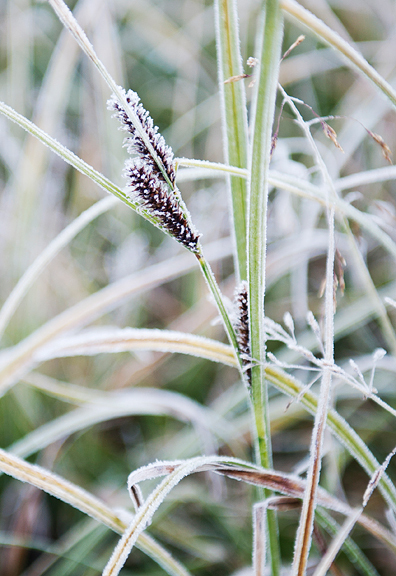 Or maybe it was the morning frost that coated all of the plants at lake level? Or MAYBE it was the fact that I had packed jalapeño potato chips on this trip? In summer, we like to do no-cook backpacks if the trip is less than 3 days. It means no stove, no fuel, no cook pot, no clean up. Jeremy tends to select sweet snacks like chocolate, fruity chewy candy, cookies. I go for the savory snacks: crackers, salami, and jalapeño potato chips (Tim’s Cascade is the best brand, just ask Diane). Salt is what I crave on the trail. I must have it! But the spicy is that added bonus. Spicy is happiness. 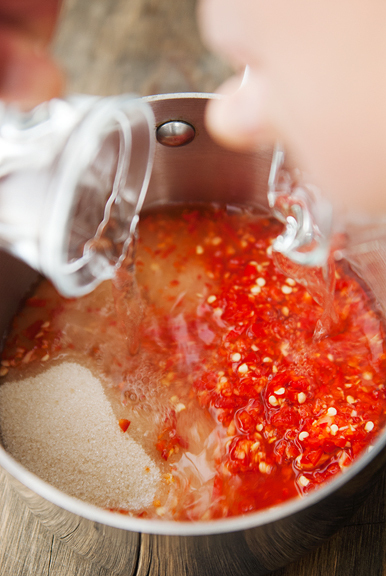 I recently learned to make some incredibly easy happiness – Thai sweet chili sauce – which just makes things even MORE happy. I have had this sauce countless times at various restaurants without ever realizing that it was a sauce, a food, something I could make. 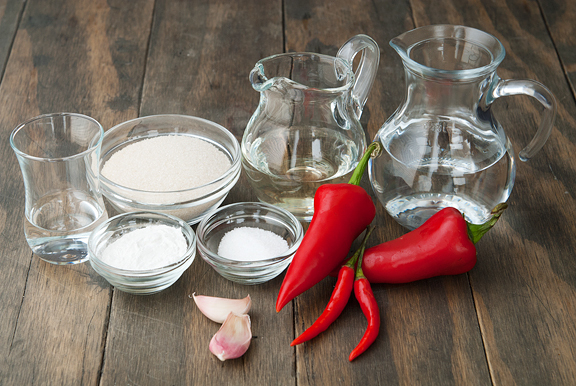 The other day as I barreled down the aisles of the Asian grocery store ticking off the items on my list, a bottle of Thai sweet chili sauce grabbed my attention. The hamsters in my brain ran around a few times before it registered that this Thai sweet chili sauce was the same dipping sauce I enjoyed with spring rolls and other delicious appetizers. As I reached for the bottle, the hamsters ran in the other direction. Wait a second… *I* could make this myself, right? A quick search on my smartphone replied that yes, yes indeed, I could make my own sauce. And it was so simple! How was I unaware of this for all these years? I pulled my hand back from the sauce shelf and wheeled my cart to the produce aisle to pick up some Thai chilis. The Fresno chilis required a trip to my local Whole Foods, but I had everything else in my pantry at home. 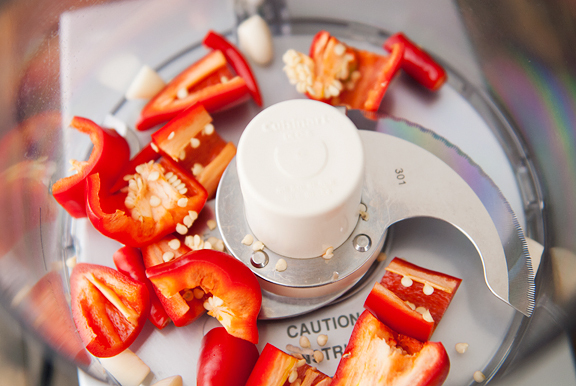 Total time on this recipe was 15 minutes including preparation of the peppers and garlic. The sauce is nice and spicy, the way I like it. 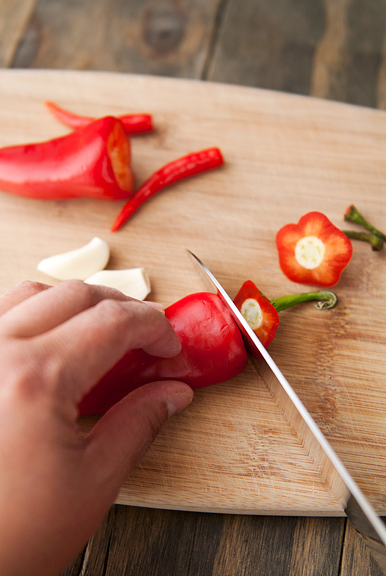 If you want to reduce the heat, use milder chilis or remove the seeds. Too sweet? Reduce the sugar. This would be a great dipping sauce for fried wontons, spring rolls, egg rolls, pot stickers, fried things (vegetables, meats), grilled shrimp, whatever you can think of that could benefit from a spicy-sweet kick. Purée the chilis and garlic together until smooth or slightly chunky (I like slightly chunky). 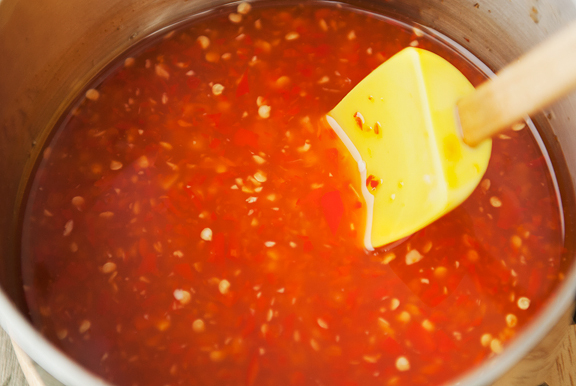 In a medium saucepan, bring the chili-garlic paste, 3/4 cup water, vinegar, sugar, and salt to a boil over medium high heat, stirring to dissolve the sugar. Let simmer for 3 minutes. 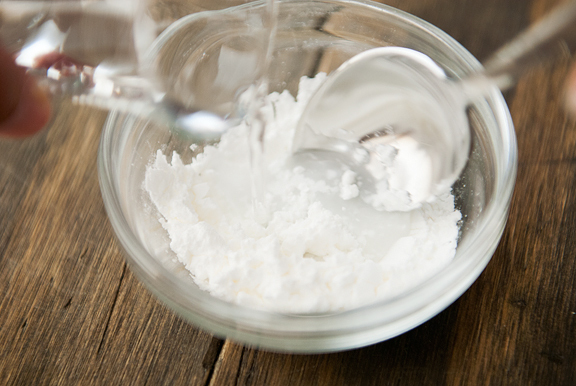 Mix the cornstarch and 2 tablespoons of water together in a small bowl. Pour the cornstarch mixture into the sauce and stir. Heat until the sauce thickens (a minute or so). Let cool and refrigerate. Makes about 1 1/3 cups. Such beautiful pictures, and I always enjoy hearing about your escapades…lol. Love the pic of you and your honey. I can always see the love you have for each other when you’re together. I miss Kaweah’s smiling face in your posts. Love all your recipes, too. I can’t do spicy-hot, but they sure do look yummy. Gorgeous scenery. I lived in NM for 7 yrs as a teenager (many years ago) and miss seeing the Organ Mountains I used to view on a daily basis. I get homesick thinking about it. I look forward to making this recipe as all the ones I have made to date have been delicious (will be making your wonton soup in a few days – soup weather is here)! Wow…how did you make it look so easy? 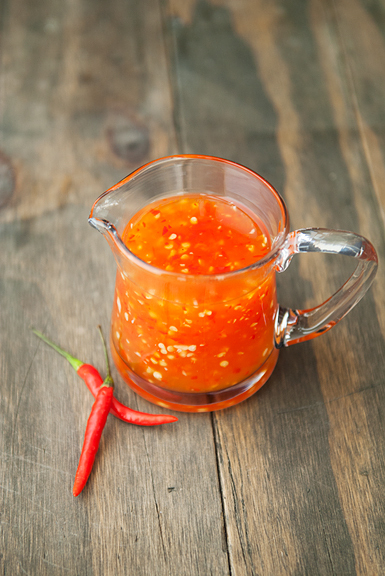 Love Thai chile sauce and now cannot wait to make my own. Hugs to you again on the loss of your dear Kaweah. – How long do you think it could last in the refrigerator? – I guess that due to the high amount of sugars and vinegar it must be a good candidate for canning, does it? 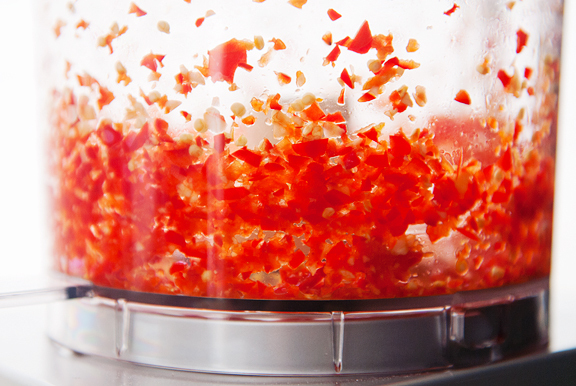 Would a simple boiling water bath or wold it require the full she-bang of high-pressure cooker in your opinion? That looks like a lovely backpacking trip! I like the no cooking idea. My husband wants to backpack when the kids are out of the house, and food (and bears) is one of my biggest fears. I don’t think I could handle the “just add water & stir” meals, so your snacks sound perfect! I fancy myself adventurous because I take day hikes when I travel…you put me to shame ;) I’m totally digging this sauce, love me some sweet heat! So nice to hear that you’re feeling good!!! Keep it going….I love savory snacks, too, but I won’t say “no” if someone offered me a chocolate either. 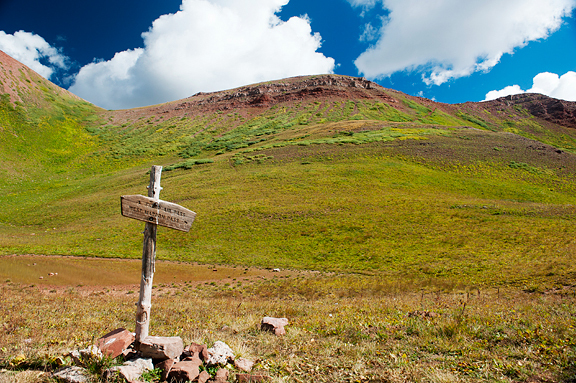 The snapshots from your hiking trip are beautiful, but I imagined to be there in person must be awesome! Thank you for the recipe. I don’t remember how I found your blog – but I’m so glad I did – every single time – thanks. I always leave inspired. Massive hug in remembrance of Kaweah. Also, I am only just beginning this outdoor adventures phase of my life but already find myself nodding along when I read some of what you have to say about being out there, about all of it. Love this. So glad you were able to avoid the craziness of WHATEVER, USA. As I read about it today, it sounds like a drunken nightmare to get out of town. What were they thinking? You two look happy on your backpack adventure, totally in your element. Bittersweet memories prevail, however. Loved this post–the pictures were a breath of calm and beauty for me while listening in on a conference call. Agree with Jill above, bittersweet memories. Sending love and comfort to you both. So glad you did this! And that! I did that hike over thirty years ago and not sure i could do it again! But i should. And with that chili sauce, too! Just made pizza that was Thai Sweet Chili Sauce as base. Layer on cooked chicken breast & thin-sliced zucchinis. Cover w/ grated mozzerella cheese. Bake. Serve w/ chopped cilantro. Quite good. 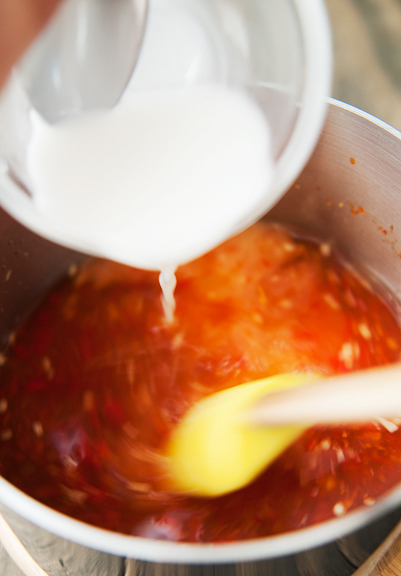 And now, thanks to you…..I can make my own Sweet Chili Sauce! 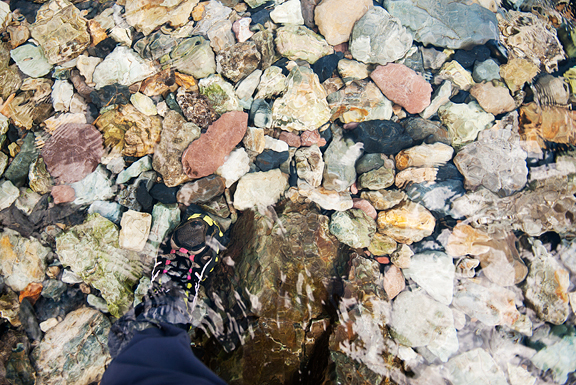 Your photos are always smashing; I enjoy seeing your Colorado, but it is the variety and beauty of the rocks under your feet as you cross the stream that make me want to visit your high country. Thank you. Lovely pictures. I’ve been backpacking this summer, the Long Trail, cute little mountains compared to Colorado. Sigh. I am blessed though to live so close to the highest mountain in the state. 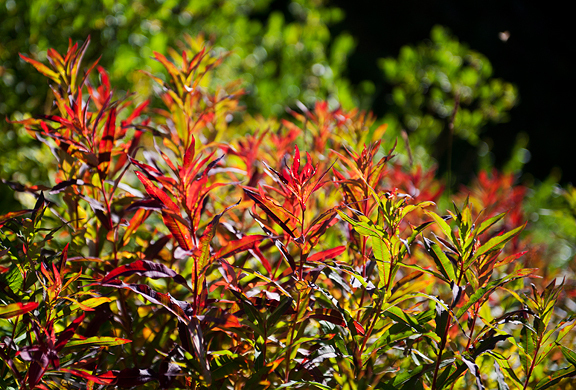 It’s become more like my training ground, I’m getting ready for tourist season coming to view the fall foliage. No huckleberries here, blueberries and I even found cranberries,though. Surprising, considering I’ve been trying to grow them with minor success down valley. Happy trails to you, keep those pictures coming. 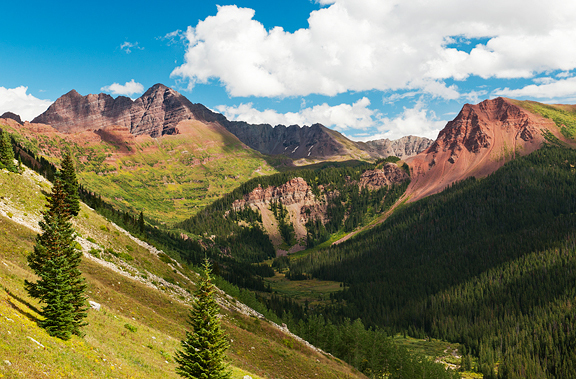 Those back country Colorado mtns are on my list. Jane – there’s something quite magical about living in the west near the mountains! guindilla – I think this could last at least 2 weeks in the refrigerator if not more. I imagine you could can it, but I don’t actually know how “safe” it is. If in doubt, you can always try freezing it. Kristin – A bear canister helps with bears and other critters. You can either rent one from REI or a wilderness office or you can purchase one. Pey-Lih – it was very pretty, indeed! jill – it just wasn’t something we wanted to have anything to do with (Whatever, USA – how stupid). I think Kaweah is going to be in lots of memories for years to come. But what sweet memories. Trolleira – :) Can you believe it’s so easy to make?! Helen – mmm, sounds like a terrific pizza! Marcel – :) The rocks here are quite beautiful. Yes, come visit!